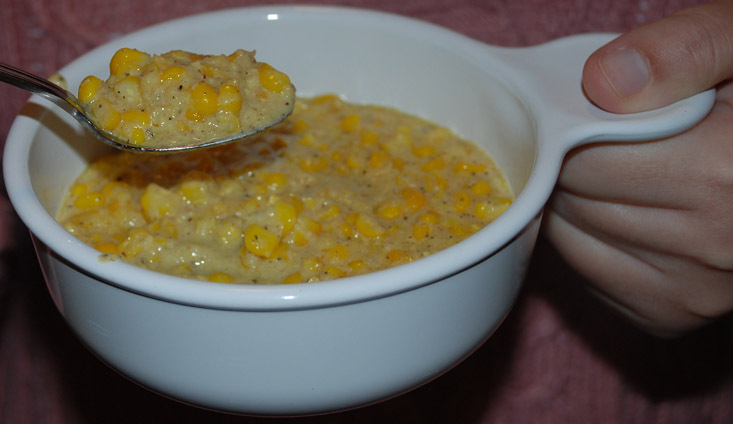 This recipe is derived from what my grandmother (from my mom’s side of the family, aka Mommom) taught me about creamed corn. The credit primarily goes to her, with side credits to Alton Brown of Good Eats (where I’m positive I picked up the bowl-in-a-bowl idea for easier milking, and of course for getting me hooked on kosher salt) and my wife Meabh for her aid in taste-testing and critiques as I figured out proportions. If a recipe of mine isn’t just pulled from the internet or from Good Eats, there’s a nearly 100% chance that its origins lie in either my mother’s or her mother’s influences on me. I’m always striving to just come close to the culinary masterpieces I grew up enjoying. Unfortunately I often fail at writing down what they tell me, so I wing it and it never quite matches what I expect. You could almost call this a fried corn, rather than creamed corn. Creamed corn has a lot of negative connotations for many people I’ve spoken to about it, and I attribute this to lunch-ladies and the horrid abomination Del Monte and others can and call ‘creamed corn.’ Trust me when I say I wouldn’t touch that stuff, and you shouldn’t either, with this recipe available to you. Hit the jump to see what I’m talking about. 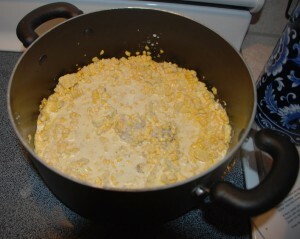 First and foremost, the only really ‘hard’ part of making creamed corn is what we call ‘milking’ the corn. Go ahead and remove the husks and silk from your corn. Do it by hand. Those tools that ‘help’ really aren’t going to do much good. And it gets really fast and easy with some practice. Builds character! 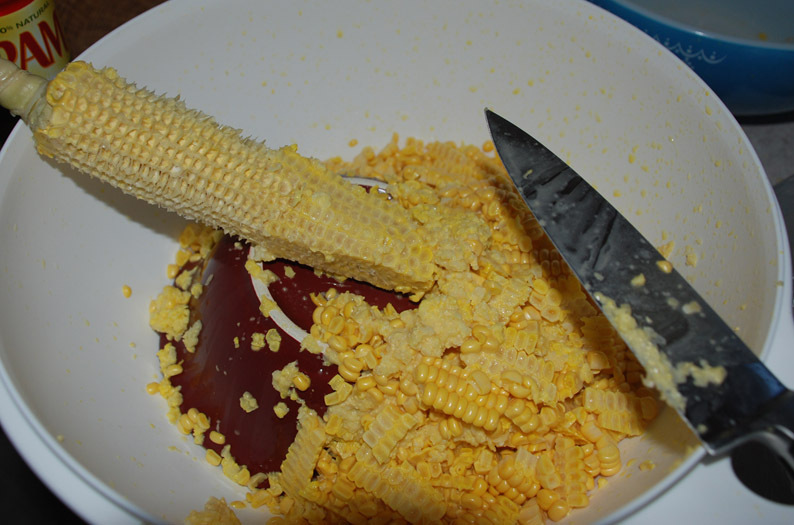 Once all your corn is all as naked as it never wanted to be, take a large bowl (you really want large, this is going to splatter some, so do yourself a favor and make cleanup easier. Do this outside if you don’t have a large bowl to use) and place a smaller bowl upside down in the bottom as a perch to work on. Using a sharp knife (I prefer the larger one as pictured below, as it gives greater control and stability for the entire process) place one end of the corn on your inverted bowl, and cut the top half of the kernels off the cob as evenly as possible, all the way around. Once all the kernels are littering the bottom of your bowl, you begin the part that will give you hand cramps if you really try and scale this recipe up. Holding the knife perpendicular to the surface of the shorn-cob, scrape the blade up and down the cob, evicting all that juicy corn goodness while leaving behind the remaining pulpy bits. Click the image to get a closer view. You can see how I’ve milked the top half of the cob clean of its juice, and the difference in appearance with the bottom half I’ve yet to conquer. Once your ear is cleaned, discard it with the husks for later composting. Repeat for your remaining ears of corn. And don’t take forever, that poor naked corn is cold, after all, and exposed to prying eyes. I can do 6 ears of corn in under 20 minutes now. Practice definitely helps. Don’t rush too much and scrape your knife right into something substantially more tender and beloved than your ear of corn, of course. When all finished, use your nearest handy spatula to assist you in removing your corn to an appropriate sized non-stick saucepan. Yeah, I’m using one a wee bit large here, but it was the most convenient to grab for me, so there it is. In front of my pan, you’ll notice my remaining ingredients. 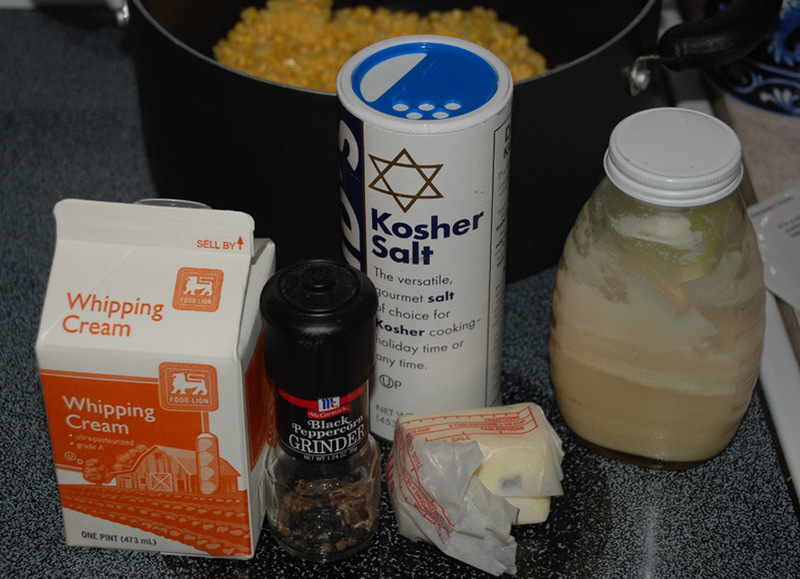 Kosher salt is your friend, and you really want the bacon grease as well; it does so much for the flavor. If you don’t have stored grease in your fridge, use some fresh bacon and fry it up, then drain the grease and add it in. Oh, and crumble that bacon and set it aside for later. Go ahead and add all your ingredients. Take it easy on the salt and pepper to start, you can always add more, and you want to let the corn get cooked before really digging in on heavy flavoring. Turn your stove up to medium-high and prepare to stir vigorously for a bit. Here you see the ingredients as they begin to melt into our mixture. I went heavy on the pepper, as I just don’t think its real creamed corn without a nice bite to it, and I’ve got some experience in how much I can safely add to start. You can always add seasonings, but you can never take them away! Stir it frequently while the heat does its thing, you should actually have the bottom layer trying to brown and burn on you. The former is ok and desired, the latter is bad and to be avoided. So keep stirring as it tries to burn for several minutes. Once you’ve browned a good bit of the corn, turn the heat down as low as it can go, and let your corn simmer and stew and reduce for a good hour, if not more. Stir occasionally, and every 20 minutes or so give it a taste and add salt and pepper as desired. If you wanted to get fancy, you could experiment with other savory seasonings from your spice cabinet. I personally love the flavor of corn by itself, and with the bacony additions I see no need for further spices. If you desire, you can add more cream and butter as it reduces over time. The last time I made a very large batch, I ended up adding quite a bit of extra cream towards the end before simmering some more, to achieve the consistency I wanted. Once its simmered at least an hour (more if you’ve got a lot more than 6 ears cooking in there! ), you can add that crumbled cooked bacon you put aside earlier, if you so wish. Trust me. Its really a good addition. But you can live without it if you must. You can actually live without the bacon and its grease entirely, but you really don’t want to if you have a choice. And there is the finished product. Once I declare its finished, my wife rushes in to sample it in large amounts right away. I’m not far behind her. If I want this to last more than a day, I have to immediately take a portion and prepare it for freezing. If you intend to make a large batch to freeze for future meals (my grandmother always does this for Thanksgiving), remember to take it a bit easier on the pepper. It’ll only get spicier with age in the freezer. As a Jew. I am offended by your use of kosher salt and bacon grease. You of all people should know, kosher salt derives its name from its use in making meats kosher, rather than its mere state of being kosher 😉 And I totally offered the option of leaving out the bacon grease entirely, specifically for you and Mikaiya! Koshering salt is a more accurate name, by the way, but its longer and I’m lazy.